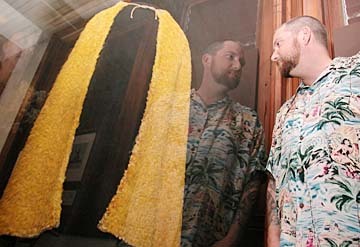 Greg Poirier examined a feather cape worn by King Kamehameha during a visit to the Bishop Museum last week. that will star "The Rock"
"I have a feeling about this one," screenwriter Gregory Poirier says, weaving his rental car through Waikiki traffic. "I've done other films where I've felt everything was going to go well and they did. That's what I'm feeling about the King Kamehameha project. Everything feels like the right fit." The right fit: Poirier's background, having been raised on Maui with an understanding Hawaii's history, plus having a major Hollywood star of Polynesian descent attaching himself to the film. That, of course, is Dwayne Johnson, a k a The Rock of wrestling renown. "I've been trying to get this movie made for more than eight years," said Poirier, who also wrote the script for John Singleton's highly acclaimed "Rosewood," a film about racism in the South. "Rosewood" was set in 1923 and told of how a white woman's claims that she was assaulted by a black drifter caused a lynch mob to burn down a black town. "I've wanted to do (the King Kamehameha story) ever since I became a successful screenwriter, but there had never been an actor who could play or look the part." In stepped producer Jon Shestack, for whom Poirier had written a Kamehameha story outline eight years ago. In May, Shestack invited Poirier to lunch in Santa Monica. The producer pulled out Poirier's tattered treatment. 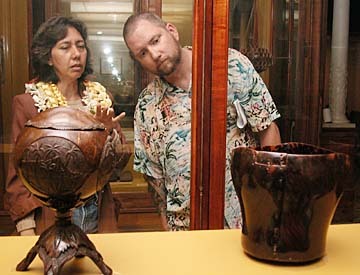 Betty Kam gave Greg Poirier a tour of the royal collections at the Bishop Museum as Poirier researched his screenplay on the life of King Kamehameha last week. "I have two words for you," Shestack said. "The Rock." The pair met with Johnson, who "went nuts for the story," Poirier said. "I know Kamehameha's story," Johnson told the two men. "This could be my 'Braveheart.' "
Once Johnson attached himself to the unnamed film, the pitch at Sony was easy. The studio bought the idea and gave Poirier the green light to write the script. "My feeling was you either make this movie with a great movie star or not at all," Poirier said. "We've been waiting all our lives for an actor like him to come along with that big box-office draw, so history can be told realistically. "Mel Gibson and Kevin Costner weren't going to work in the part. There was just nobody." Poirier's representatives quickly set up a script deal at Sony, with executives Shannon Gaulding, Amy Baer and Peter Schlessel making a preemptive buy of the material. "It shows that if you hold on to your nearest and dearest projects, eventually the circumstances will line up in your favor," Poirier said. The next step is completing a draft and having Johnson accept it. "Then we're off and running," Poirier said. Johnson, who grew up on Oahu, is half-Samoan. Poirier expects "some quibbling" about a Samoan playing a Hawaiian. "But he's a Polynesian playing a lead role in a major Hollywood movie of Hawaiian history and that should be celebrated because the story is being told." KING KAMEHAMEHA I, also called Kamehameha the Great, was said to have been born into a royal family in 1758, when Haley's Comet was visible. Believing that the comet portended the birth of a fearsome conqueror, his grandfather tried to have the baby (then called Paiea) killed, but he was secretly rescued and brought up in isolation. Kamehameha means "the very lonely one." As an adult, Kamehameha became chief of the northern half of the Big Island. Eventually, he brought the entire island under his reign. The other Hawaiian islands were controlled by other kings, but Kamehameha conquered and united them, becoming ruler of all the islands by 1810. Poirier hopes to complete the draft in about three months. If the other actors and director sign on early enough, three to four months of filming could begin in Hawaii next January or February, although Poirier says spring is more realistic. He expects a late 2003 or early 2004 release. "Neither Dwayne nor I have any intention of goofing on this character," Poirier said. "We're not going to turn this into a 'Terminator' movie. "I can't speak for the Hawaiian community or descendants of Kamehameha, but this subject will be treated with reverence and respect and told as honestly as possible." Poirier said Kamehameha's life story reads like a movie, including the prophecies that came with his birth, escaping death shortly after, the great battles he fought, and the love story with Ka'ahumanu. "It's a huge cinematic life this guy lived," said Poirier, who was on Oahu last week visiting sacred Hawaiian sites, meeting with a Hawaiian Studies' professors at the University of Hawaii, and visiting Bishop Museum. "The last few days I've made a big effort to extend myself to the Hawaiian community to make it known how serious I take this project," he said. The story will follow Kamehameha from birth to death, but focus on his unifying the islands. "That was building a bridge from the ancient world to the modern," Poirier said. "To me, the story is about Kamehameha being the first man in Hawaii who realized how big the world was outside of Hawaii. And he knew that that world was coming soon. "He was building for survival of the way of life of Hawaii." Poirier assumes filming will be done on all the major islands. "When I mention to the name Kamehameha some people say, "Oh yeah, I saw an episode of 'I Dream of Jeannie' where she brought him back to life,' " Poirier said. "But he was this fantastic, larger-than-life warrior king. The islands had been ruled by tribes, with different chiefs fighting each other all the time. People think of Hawaii as lolling in the surf, little umbrellas in drinks, but back then it was a brutal, war-oriented society, and Kamehameha pulled them into the modern age."